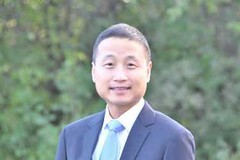 Associate Editor, Dr. Lyndon Hernandez, MD, MPH, highlights this article from the January issue “Prior gastroscopy and mortality in patients with gastric cancer: a matched retrospective cohort study” by Wai K. Leung, MD, et al. This nationwide observational study (n=20,066) showed a reduction in cancer-related mortality among patients who underwent gastroscopy within 5 years before gastric cancer was discovered. Gastric cancer closely follows colon cancer among the leading causes of cancer deaths in the world. Unfortunately, prior studies on gastroscopy for reducing cancer-related deaths analyzed much smaller populations. This largest study to date highlights the need for clearer guidelines for screening, surveillance, and symptomatic patients, akin to colonoscopy for colon cancer. Gastroscopy plays an important role in the surveillance of patients at risk for gastric cancer. Figure 1. Flow diagram of patient selection.∗ A case could be excluded because of more than 1 criterion. Therefore, the total excluded cases in each step may outnumber the sum of case numbers excluded by individual criteria. <2 Y cohort: receiving endoscopy between 6 months and 2 years before the index date; 2-5 Y cohort: receiving endoscopy more than 2 years and less than or equal to 5 years before the index date; >5 Y cohort: never received endoscopy within the previous 5 years of the index date. 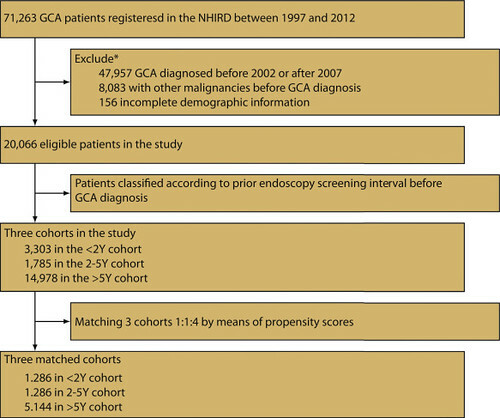 GCA, gastric cancer; NHIRD, National Health Insurance Research Database.